The Northern Prawn Fishery (NPF) is Australia's most valuable Commonwealth fishery managed by the Australian Fisheries Management Authority (AFMA), a statutory authority appointed by the Federal Government to manage Commonwealth fisheries on its behalf. The fishery is located off the northern coast of Australia between Cape York in the east and Cape Londonderry in the west (Figure 1). Under the Offshore Constitutional Settlement (OCS) arrangements with Queensland, Northern Territory and Western Australia, the fishery extends from the edge of Australia's fishing zone (AFZ) to the limit of low water on the shore and covers an area of approximately 800 000km2 of ocean, although only approximately 15% of the area is fished. The NPF is currently managed under the Northern Prawn Fishery Management Plan 1995 (NFP Plan) and is a limited-entry, input-controlled fishery. The current inputs regulated under the Plan are the number of trawlers that may fish in the fishery, the size of the trawler used for fishing, and the power of its main engine. Entry to the fishery is authorised through the holding of Statutory Fishing Rights (SFRs) defined under the Fisheries Management Act 1991, and the SFRs are recognised as being a form of property right created by statute. The NFP Plan of 1995 provides for the granting of two classes of SFRs: Class-A SFRs are based on the vessel-size and engine-power of participating boats, and are further divided into the categories of: "active", "surplus" and "suspended", on the basis of their historical and current status. Class-B SFRs limit the number of boats in the NPF. Under the NFP Plan, a trawler used by a concession holder to operate in the fishery must be nominated against one Class-B SFR, and against a threshold number of Class-A SFRs, which is known as the "applicable number of Class-A SFRs". These are calculated from: the sum of the underdeck hull volume, and the maximum continuous rated power of the main engine in the boat, expressed in kilowatts. The Plan limits the total number of Class-B SFRs to 133 (note: there are currently only 132 Class-B SFRs in the fishery, as one has been cancelled since the Plan came into force), and the total number of Class-A SFRs to 53 844. All SFRs in the fishery are fully transferable and may be bought, sold or leased. The Plan provides the objectives to be pursued in managing the fishery, the measures by which the objectives will be pursued, and the performance criteria by which management of the fishery can be assessed. The objectives in the Plan parallel the AFMA's legislative objectives as set out in Section 3 of the Fisheries Management Act 1991 and include, but are not limited to, objectives relating to ecological sustainable development of fish resources, the precautionary principle, and the economic efficiency of the fishery. The target commercial catch includes white banana (Penaeus merguiensis), Indian banana (Penaeus indicus), brown tiger (Penaeus esculentus), grooved tiger (Penaeus semisulcatus), giant tiger (Penaeus monodon), blue endeavour (Metapenaeus endeavour), red endeavour (Metapenaeus ensis), western king (Penaeus latisulcatus) and red spot king prawns (Penaeus longistylus). The annual gross value of production ranges between $A100 million and $A150 million. The long-term annual sustainable yield is projected at about 4000t of banana prawns and about 4000t of mixed species of tiger, king, and endeavour prawns, of which the majority are tiger prawns. Prawn fishing began in the NPF in the 1950s when banana prawns were discovered in the Gulf of Carpentaria (Figure 1) in remote Northern Australia. This discovery created interest in both fishing and scientific communities, and proposals to undertake formal exploratory fishing surveys were first discussed in the late 1950s and early 1960s. Exploration was undertaken by private companies in the late 1950s as a result of Government concerns that the Queensland East Coast and Northern New South Wales prawn fisheries were becoming over-capitalised and over-exploited, it was agreed that new fishing grounds needed to be found. However these surveys did not yield encouraging catches of prawns. The first formal prawn survey of the Southern Gulf of Carpentaria region commenced in 1963. As result of collaborative efforts by industry and the CSIRO, a commercial prawn fishery was established there by the late 1960s. The main species caught at that time were banana prawns, but the fishery was slow to develop due to the remoteness of the area and lack of infrastructure. The fishery expanded beyond the Southern Gulf of Carpentaria during the 1960s, and the first banana prawns caught in Joseph Bonaparte Gulf were recorded by a Japanese research vessel in 1967. In the same year the Department of Fisheries and Fauna of Western Australia undertook surveys from Broome to King Sound, but with little result. Between 1968 and 1972 surveys were conducted in the Joseph Bonaparte Gulf, Kimberley and Vanderlin Islands regions (Figure 1). There is no formal documentation on the number of boats fishing in the NPF in the mid- to late-1960s. However records exist indicating that at least 65 boats landed product in 1968. During this period the majority of the fleet were small wooden trawlers with ice boxes or brine tanks under the sorting tray. However a number of trawlers owned by the Japanese and Chinese from Taiwan were fishing in the NPF in the late 1960s and early 1970s. These foreign-owned trawlers generally supplied motherships operating in the NPF and were able to fish 24 hours a day, whereas the local small wooden trawlers had to return to port at frequent intervals to unload, refuel and obtain stores and supplies. Interest in the fishery escalated in 1974 when, as a result of huge monsoonal rains, in excess of 12 500t of banana prawns were caught. This bumper season, coupled with the open-door policy of the government of the day, which was intent on developing Northern Australia and increasing industry interest, resulted in vessel numbers and fishing effort rising at an alarming rate over the next couple of years. At this time it was an open-access fishery, with no input- or output-controls in place. Large catches of tiger prawns were also being recorded at this time and the negative impact on the stocks was inevitable. During the 1960s, fishing gear was limited to a single otter trawl net towed off the stern, but by the early 1970s most vessels were towing double-rigs, known as twin gear, with on each side of the vessel, a net towed from a boom. This dramatically improved prawn catches. Due to the remote location of the fishery it was inevitable that larger, purpose-built trawlers with considerable freezer capacity would need to be built if the fishery were to expand. The first Australian freezer vessels entered the fishery in 1970 and by the end of that decade more than 120 new freezer vessels had been built. These vessels were the most technologically advanced trawlers of the time, having the latest electronic fish-finding equipment, lazy line winches2 , snap freezers, prawn sorting conveyors, Kort nozzles and controlled-pitch propellers. 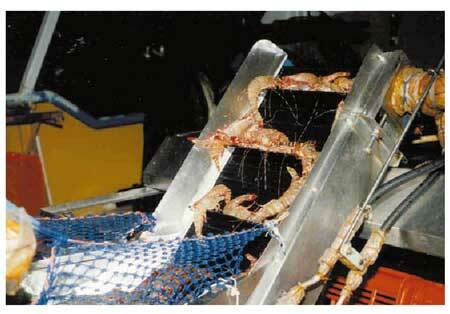 By the mid 1980s no wet boats (those that held prawns in ice or chilled brine only) remained in the fishery (Figure 2). The rapid increase in the number of new purpose-built freezer vessels was partly due to the introduction of the Government's shipbuilding subsidy3 which was designed to maintain a viable Australian shipbuilding industry and to assist Australian shipbuilders to compete internationally. The arrival of the freezer-boats caused the fishery to expand, with additional grounds explored in areas further west along the Arnhem Land coast and beyond. With the expansion in fishing grounds came a diversification in the species caught, and tiger prawns became an increasingly important part of the catch. Unlike the itinerant East Coast wet boats that would usually only travel to the Gulf for the banana season earlier in the year, and then return to the East Coast of Queensland prawn fisheries, the freezer-boats spent most of the year committed to the Northern Prawn Fishery. Prior to the introduction of freezer-boats in the fishery, vessels spent only 11% of their available fishing year in the NPF. In 1990 this had risen to 80% (Figure 3). Fishing effort and capacity continued to escalate in the fishery throughout the 1970s with no controls on the numbers or size of vessels in the fishery. It was not until 1977 that regulations to control effort and capacity were considered, and a moratorium was placed on new vessels entering the fishery (discussed under Section 3). The first formal advisory committee - NORPAC4 - formed to provide advice to the Government on management of the Northern Prawn Fishery was established by the Government in 1977, and for the first time provided for formal industry participation in the fisheries management process. It was at the behest of industry members of NORPAC that, in response to concerns about the increases in vessel numbers and the resultant fishing effort, a moratorium was introduced on new vessels entering the fishery, and limited entry was introduced into the NPF in 1977 through a three-year moratorium on licences as part of an interim management plan. The effect of the limited entry policy was to provide the participants in the fishery with exclusive commercial access to the NPF. It was not recognised at the time, but this was the first step in the establishment of property rights in the NPF. The limited-entry policy would remain the only access right in the fishery until 1984. However, as a result of liberal entry criteria, the limited-entry policy did not slow entry to the fishery and a total of 292 `endorsements' were issued, compared with the 145 trawlers which had fished the year before. Endorsements were transferable and, due to a liberal boat-replacement policy, entitlements were transferred to larger purpose-built trawlers committed to the NPF, thus resulting in considerable expansion of fishing capacity. The failure of the limited-entry policy to control the expansion of fishing capacity and effort resulted in a proposal by the Government to revise the fishing capacity by introducing a `unitisation' system for the rating of each vessel, and to constrain increases in fishing capacity through restrictions on boat-replacement. The proposal to `unitise' vessels had been first mooted in 1979, although at that time it was proposed that the units be based on hull size only. Whilst the initiative had wide consideration, and some acceptance by industry, it was abandoned. The expanding effort and capacity in the fishery was further exacerbated by a decision taken in 1980 to allow, without penalty, boats below the size that attracted a shipbuilding subsidy, to be replaced with vessels qualifying for construction subsidies (150 gross construction tons and about 23m in length), with such vessels over the subsidy-size being replaced on a one-for-one basis. This decision was taken as a concession to owners of small-boats whose vessels had not qualified for the shipbuilding subsidy. This proved to be retrograde step as it resulted in wide-scale boat-replacement, thus substantial increases in vessel size and capacity, to the detriment of the biological and economic sustainability of the fishery. In 1981/82 an industry/government working group was established to review management arrangements in the NPF. This working group produced several recommendations, one of which was that a management advisory committee should be established to advise on NPF management, and another was that this committee should report to the Minister for Fisheries, rather than to the existing Northern Fisheries Committee (made up of Directors of Fisheries from the State and Territory governments). As a result NORPAC was disbanded and the Northern Prawn Fishery Management Advisory Committee (NORMAC) was established. The working group also considered a number of options for addressing the over-exploitation of prawn stocks and the over-capacity in the fishery. These included, but were not limited to: the proposal to unitise (measure and control fishing capacity) the fishery, the possible introduction of a buy-back scheme, a more stringent boat-replacement policy, and area-closures to protect prawn stocks. In reviewing the unitisation proposal, NORMAC and industry were of the view that, if introduced, to be effective such a system must include both hull-size and engine-power constraints, and must be capable of being controlled and enforced. The total number of class B-units was determined by the number of boats licenced to operate in the fishery, which was fixed with the introduction of limited-entry in 1977, with revised limited-entry criteria confirmed in 1980. In total, 133 269 Class-A and 302 Class-B6 units were granted. All units of Class-A and Class-B were/are transferable, and remain the "currency" in the fishery today. Transferability of Class-A units allowed fishers to use any size boat they chose, provided that the requisite number of Class-A units was attached to each boat and that the existing total pool of Class-A units did not increase. These units in the NPF quickly achieved a market value, and financial institutions accepted them as collateral against loans. This resulted in the units quickly being accepted as the `currency' and as the property rights in the fishery, and they also became the basis on which additional constraints were imposed, to offset continual increases in fishing effort. In 1985 a voluntary buy-back scheme was implemented to remove the excess capacity-units, in response to concerns that stocks were being overfished and that the fishery was over-capitalised. The buy-back was industry- funded by a Voluntary Adjustment Scheme (VAS) loan, and supported by a Government guarantee. At around this time, a `user-pays' policy was adopted by the Government, that required industry to pay levies for the government's costs in management and research on the fishery. Levies, including those to fund the buy-back scheme, were calculated based on the number of Class-A units held. 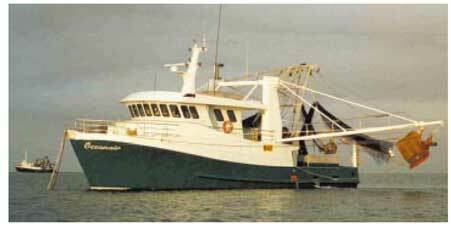 There were a total of 133 269 Class-A units and 292 active Class-B units attached to vessels in the fishery. A more restrictive boat-replacement policy was implemented in 1987, requiring any owner who decided to voluntarily replace a boat of any size to forfeit one extra Class-B unit. For vessels measuring over 375 units, an equal number of Class-A units to the total Class unit holding of the replacement boat also had to be forfeited. In 1987 gear restrictions were implemented to reduce fishing effort. Whilst not directly proportional to the units held, an arbitrary two-tiered gear restriction was imposed on vessels, based on whether the vessels were under- or over-375 units. Boats rated as under 375 Class-A units were restricted to towing a maximum of twin 9-fathom nets, and boats rated larger than 375 Class-A units were restricted to towing a maximum of twin 14-fathom nets. In 1990 NORMAC agreed to a further reduction in Class-A units so as to achieve a limit of 54 000 Class-A units by the beginning of the 1993 prawn season. This was to be achieved by an accelerated buy-back scheme, and a compulsory, across-the-board proportionate surrender (forfeiture) of Class-A units in 1993 so as to achieve this target (if necessary). At the end of 1992 the target was not reached, and on 1 April 1993, 30.76% of the remaining Class-A units were compulsorily cancelled, in accordance with the surrender provisions contained in the NPF Management Plan. After the establishment of the AFMA and its enacting legislation, a new NPF Management Plan was established in 1995 under the Fisheries Management Act 1991, to replace the Plan which had been in place under the Fisheries Act 1952. The fishing rights granted under the 1952 Act through the NPF Management Plan, being the Class-A and Class-B units, were automatically rolled over into the new Plan, and became A-Class and B-Class Statutory Fishing Rights (SFRs). This meant that each operator was given the equivalent number of A-Class and B-Class rights under the new Plan, as they held under the previous Plan. However the SFRs established under the Fisheries Management Act 1991 were considered to have more security than the rights which existed under the Fisheries Act 1952, being a form of property rights established by statute; having a life of at least ten years; being automatically `rolled over' if the NPF management plan is revoked and a new plan is implemented in the fishery; and with compensation that may be payable if the rights are acquired on unjust terms. It is worth noting that the rights issued under the 1952 Act: were issued for a period of 12 months; were renewable at the government's/Minister's discretion; had no on-going tenure and no provision for compensation. In my view, the implementation of management measures based on Class-A units, including the allocation of Statutory Fishing Rights under the Fisheries Management Act 1991, has firmly entrenched the Class-A units allocated under the NPF unitisation scheme, as the `currency' and property rights in the NPF. This premise is generally accepted by NPF industry, by financial institutions, the Australian Fisheries Management Authority and the Courts. The main policy objective behind the NPF unitisation system was to provide a system of management which would allow fishing capacity to be measured and controlled, in order to avoid over-exploitation of stocks and over-capitalisation in the fishery. It was considered at the time that boat-size and engine-power were a reasonable measure of fishing capacity. The concessional units7 awarded to the owners of small vessels were not a matter of policy and had little to do with the benefits of the vessel unitisation system as a capacity-controlling measure. These concessions were agreed to through industry negotiation, in compensation for the fact that the smaller vessels were not eligible for the shipbuilding subsidy. Whilst some rationalisation of the fleet was desirable through the boat-replacement policy, the unitisation policy was not based on the need, or desire, for any distributional change within the overall fleet structure. The introduction of unitisation in the NPF occurred in 1984 at a time when few Australian fisheries had rights-based manag- ement. At that time management of fisheries was generally carried out by government departments and/or bureaucracies, with little input from the fishing industry or other stakeholders. As a result, the development of the unitisation system was carried out by employees of the Australian Fisheries Service, a Federal Government department. However, considerable consultation took place with NORMAC and the NPF industry prior to the implementation of the system. In addition, NORMAC, government, and industry representatives consulted with boat-builders and engine-manufacturers to determine an appropriate formula that would allow the inclusion of both boat-size and engine-power in the unitisation system, and provide for a system of controls which would not be easily open to manipulation, and which could be policed. At the time of implementation the Offshore Constitutional Settlement8 had not been signed and various areas of the fishery were under either State or federal jurisdiction, which required fishers to have both State and federal fishing licences to participate in the fishery. This needed the involvement of both State and federal fisheries management agencies in the consultation and implementation phases of the unitisation scheme, because the State fishing licences had to reflect the same management arrangements as the federal fishing licences. This formula enabled each vessel to be allocated a total number of Class-A units. No vessel could access the fishery unless it had one Class-B unit (the right to fish) and the requisite number of Class-A units attached to it. Boat-replacement was allowed, however a boat could only replace a vessel of the same or lower rating (of Class-A units), unless the operator purchased additional units from the total pool of Class-A units. In the cases where there was no particular trawler attached to a licence, the allocation was based on the licence details (boat length and engine-power) applicable to the previous boat to which the licence was attached. engine checks by compliance officers. It was considered that the data used in the allocation-process was generally reliable and were verifiable where any uncertainty existed. At the time of allocation, the only appeals process which existed was an internal (departmental) arrangement, although decisions taken by fisheries management agencies could be challenged through the legal system. To the best of my knowledge, no internal formal appeals were lodged when units were allocated although many `special case' letters were lodged, with government making some subsequent adjustments to the unit packages. There is no record of any legal appeal being lodged through the judicial process. It is considered that this may be because there were a number of means (as described above) through which operators could verify their vessel-size and engine-power ratings which, at the time, were not easily manipulated and therefore the allocation of units was relatively straightforward. It should also be noted that an intensive process of consultation and negotiation was undertaken in developing the unitisation formula, and that the allocation formula was applied consistently across all operators - i.e. all Class-A units were based on existing hull-size and engine-power at the date of the scheme being introduced. From a philosophical point of view the lack of appeals could have been due to the fact that, at the time, Australian fishers were not litigious in their approach to management, and appeals on fisheries issues were the exception, not the rule. There is no evidence to suggest that any special staffing arrangements or funding allocations were made in order to develop and implement the NPF unitisation system. Given the multi-jurisdictional arrangements that existed at the time, and the fact that there was no cost-recovery system in place, the costs of the process would have been subsumed into the budgets of the federal and state fisheries management agencies. The process of documenting unit allocations on vessel licences was undertaken by the relevant fisheries management agencies. At the time the unitisation system was implemented in the NPF (1984) the capacity formula given in Section 4.3 above was generally considered to be a reasonable measure of fishing capacity, and therefore an acceptable input-control mechanism for restricting and controlling fishing capacity. In its initial stages the unitisation system was relatively effective in controlling fishing capacity as it both restricted the number of vessels in the fishery, and restricted to a reasonable degree the catching and processing capacity of vessels through limitation of vessel-size and engine-power. The unitisation system was also effective in that it achieved some reduction in capacity and effort in its application through the boat-replacement policy (based on Class-A and Class-B units) as it resulted in a certain number of Class-A and Class-B units being forfeited as new boats were built. However over time the two-for-one boat-replacement policy proved to be ineffective: few new boats were built due to the cost constraints of having to forfeit Class-A and Class-B units, and this resulted in an aging, inefficient and uneconomical fleet operating in the fishery. The unitisation system also served as a useful, and to some degree successful, means on which to base the NPF buy-back scheme which commenced in 1985. Between 1985 and 1993, approximately 60 000 Class-A units were removed from the fishery, mostly through the buy-back scheme. However the buy-back scheme did not achieve the target set, and a compulsory cancellation of approximately 30% of the Class-A units was then required in order to reduce the fishery to the target of approximately only 54 000 Class-A units. In addition, the unitisation system has been proved to be an effective and legally defensible basis on which to implement the compulsory surrender of Class-A units (which occurred in 1993 so as to reduce fleet fishing capacity and improve economic efficiency in the fishery). On 1 April 1993, 30.76% of the Class-A units were compulsorily cancelled in accordance with the surrender provisions contained in the Northern Prawn Fishery Management Plan, resulting in a reduction in the number of Class-A units from 72 218 to 53 844, and the number of active fishing vessels in the NPF fell from 171 in 1992, to 124 in 1993. However, over time, the unitisation system in the NPF has proven to be ineffective, and it is now considered by many to be severely flawed as a means of controlling fishing effort and capacity. Advances in technology, including innovations in vessel design and engine configurations, have resulted in the unitisation rules in the NPF being manipulated in many instances. The inability of legislators to practically and cost-effectively enforce boat-size and engine-power rules, particularly at sea, has resulted in considerable uncontrolled effort-creep9 in the NPF.10 With design innovation, technological changes, and clever manipulation of the unitisation rules, the trawlers built today for the NPF have more fishing power than most of the vessels of older design and construction, and yet are rated as having considerably less Class-A units. The current unitisation system is not a flexible system. As a result it is difficult to implement effective management controls through the system when it is required to balance effort and sustainability, and not to impede the economic efficiency of the fishery. Whilst effective in reducing fleet fishing-capacity in terms of vessel numbers, draconian measures such as compulsory surrender of Class-A units do not give operators the flexibility to adjust their fishing operations in an orderly manner, because operators are unable to fish without the requisite number of Class-A units. Such measures also result in severe financial hardship, dislocation of operators and often result in costly and disruptive legal challenges. As a result of the deficiencies that have been identified in the unitisation system, the NPF is currently in the process of converting the existing harvesting rights (A-Class SFRs) to a different type of input-control harvesting right, based on fishing gear. It is important to note that under legislation regarding the AFMA and in accordance with legal advice from the Australian Attorney General's Department, to be legally defensible and to ensure that there is no redistribution of wealth (change in the value of the existing fishing property right) between operators in the fishery, the transition to the new rights must be based on the existing rights (the A-Class SFRs) and must be as directly proportional to those rights as possible. As stated above, at the time the unitisation system was implemented it was considered to be an effective method of controlling fishing capacity and effort, and it generally had the support of most operators as a useful control mechanism for the NPF. The intensive negotiation and consultation processes surrounding the development of the rating-formula, and the verification means available to operators in the allocation-process, resulted in NPF operators generally accepting, when it was initially introduced, the constraints of the unitisation system on their fishing operations. At the time the unitisation system was introduced the only stakeholders involved in the consultation process were the government and industry interests. It is fair to say that at the time of its implementation, the unitisation system was considered to be a legitimate and relatively effective method of controlling fishing effort and capacity. It was not possible to predict the advances in technology, vessel design, and engine configuration which have resulted in wide-scale uncontrolled effort-creep in the fishery since unitisation was implemented. Inequities arising from the fact that in some instances the system has been manipulated, whereas in others it has not. This is a costly exercise in terms of both catch/income constraints and management levies for those operators who have not manipulated the system. As a result of manipulations of the current system, not all operators are towing the same length of headrope (net size) per Class-A unit. Studies show that Class-A units are not a good measure of fishing effort, and that effort-creep, which cannot easily be controlled through the current system, is occurring in the fishery. The unitisation system is not flexible or easily adjustable when measures to balance effort and sustainability are required. Today, where the effects of technology and other factors contributing to effort-creep can be reasonably quantified, managers of input-control fisheries such as the NPF, must seek to identify and implement a system of management which is a better analogue for fishing effort - enforceable, flexible and adjustable when restructuring is required. A determining factor in identifying the most appropriate system would be its ability to predict with some certainty the appropriate level of effort, or the level of catches required to maintain a sustainable resource. This may disqualify individual transferable quotas (ITQs) or global totally allowable catch (TACs) as was the case in the NPF. Pownall, P. C. (Ed.) Australia's Northern Prawn Fishery - the first 25 years. 179pp. Australian Fisheries Magazine November 1993. NPF Restructuring - lessons for the future. 3pp. Taylor, B. 1992. Northern Prawn Fishery Information Notes. Special Collated issue Number 16 February. pp. 3-12.
for their assistance with this paper. 1 A try-net is a small sampling net used to determine the abundance of prawns or a fishing ground. Based on the try-net catch results, the main trawl may or may not be deployed. 2 The lazy line is the rope that is wrapped around the top of the cod end, and then around the capstan head, as a means of bringing the trawl on board when the tow is finished. 3 A direct government subsidy of approximately 20% of the construction cost of the trawler was paid to the shipbuilder to offset the cost to the buyer, which allowed trawlers to be upgraded to 150 gross construction tons and approximately 23m in length. 4 Northern Prawn Fishery Advisory Committee. 5 Units which are between the number of active units (determined by the formula) and the total of 375 issued to `small' operators are called `suspense units' as they are held in suspense. They are not transferable to other operators and if they become activated (by increasing the horsepower or being allocated to a vessel bigger than the active units), they become `active units'. 6 This included 10 Class C units: under which 10 trawlers were allowed to operate only in the Joseph Bonaparte Gulf. 8 This was a jurisdictional control agreement between federal, state and territory governments giving the federal government responsibility for managing the NPF (and other fisheries). 9 Increases in effective fishing effort resulting from new technology and other efficiencies, from improvements in catching capacity such as new technology and skills. 10 There have been many innovations over the years in response to the policy of unitization; vessels built prior to this had no reasons to compromise any of their design variables. After the introduction of this policy, responses such as `tonnage wells' and `stepped-down accommodation' (which were not included in the overall design) were introduced so that a bigger boat could have the same number of capacity units. One of the biggest changes is that engines with the same rating can have a greater output, e.g. by changing injectors and fuel settings after the motor is installed, can increase the horsepower without the motor being re-unitised. Also engine manufacturers changed the relative horsepower value without affecting the `rating' of motors by, for instance, setting the maximum continuous rating at lower levels than they were previously set. This allows operators to increase horsepower by increasing engine revolutions.